Anyone who patronizes fast food restaurants knows misspellings and outright ludicrous interpretations of your name aren’t uncommon. But that’s not what happened when Myasia Nelson tried to order from a Burlington, N.C. Domino’s last week. The word was printed on her receipt and on a digital order board visible to the entire store. According to the AP, Nelson, 20, immediately spoke to a manager about the employee, who she claims was laughing about the incident at first. According to the store’s supervisor Junior Snyder, “the employee said he couldn’t hear what she was saying, he asked her twice, and apparently he just didn’t know how to spell it and punched in something,” CBS 17 reports. The Burlington Times identified the employee as Russell Brady. “They don’t sound the same, they’re not similar words at all,” Nelson said, according to CBS 17. She added the the only explanation for what happened to her is racial discrimination. “If it were anyone else they would have never done that,” she said. 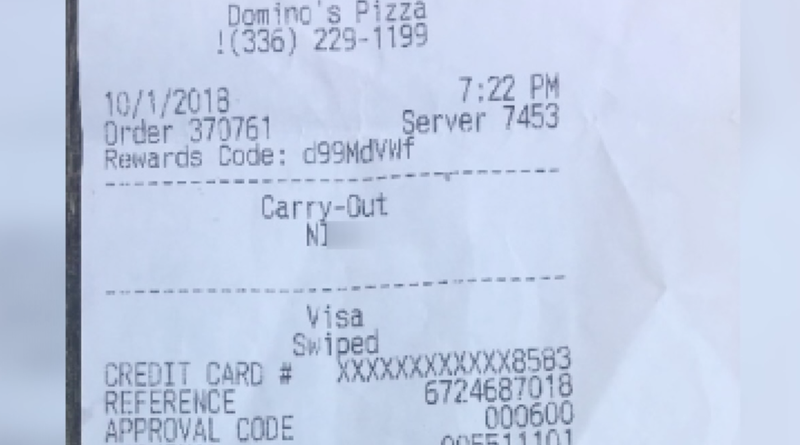 Nelson isn’t buying Brady’s excuses, nor is she buying anything else from Domino’s, it seems. She canceled her order and was offered a $50 gift card for the ordeal, which she declined. “My name is worth more than $50. I am not what he called me,” Nelson told the Burlington Times, adding that though she’s a longtime fan of the chain, she will never eat there again. Nelson told CBS 17 she accepted an apology from the store’s manager, but wants one from Brady as well.